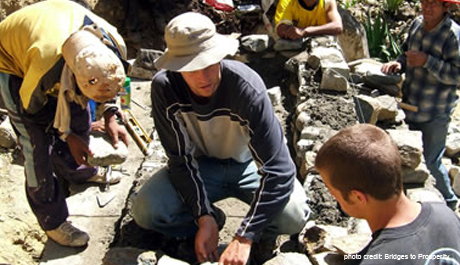 Give a Little: How your small donations can transform our world. This page is dedicated to the teachers and children who risk their lives every day for the opportunity to teach and learn. Your $30 donation to Bridges to Prosperity could open a world of possibilities for an entire family. When an $18,000 150-foot bridge serves 3,000 people, the cost is only $6.00 per person for the 20-year lifetime of the bridge. The following is a true story. walking home from school along with two of their teachers – just as they did every other school day. However, unlike children's commutes to and from school in developed countries, their daily trek included crossing a 130-foot-long suspension bridge that spanned a ravine whose bottom lay 320 feet below. On the afternoon of April 13, just a week before the bridge was schedule to be repaired, the wooden slat and steel cable footbridge snapped in two under the weight of its precious travelers returning home. Seven children, most between 10 and 13 years old, and 2 of their teachers died in the fall. More than 50 other children were injured, many of them gravely. I feature Bridges to Prosperity here because it is a perfect example of the "Aha!" quality of affordable giving paired with effective programs. When I heard Ken Frantz, founder of Bridges to Prosperity, interviewed on the radio, I had one of those important "Aha!" moments that inspired the book. In developed countries, we give very little thought to the many bridges we use every day to conduct our lives. In remote parts of the world, a bridge is a miracle. As Ken described the tremendous power of footbridges for transforming lives and turning poverty into prosperity, I distinctly remember thinking "Of course, a footbridge!" 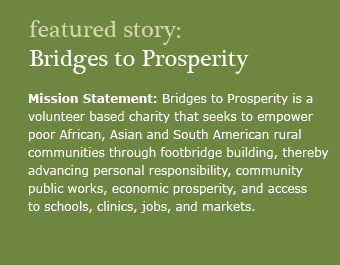 Bridges to Prosperity (B2P) constructs sturdy and reliable bridges in remote areas of the world and provides training to local residents in bridge maintenance and repair. To completely isolated villages, bridges provide safe access to everything required to realize better lives: food, healthcare, education, infrastructure, technology and income opportunities. The positive effects are difficult to overstate. Often, bridges suddenly connect thousands of people living in desperate conditions, unable or risking their lives to access basic services - to other communities and the all the services and possibilities they offer. To illustrate the effects of a lack of bridges, Frantz pointed out that the country most in need of footbridges anywhere in the world is Afghanistan. 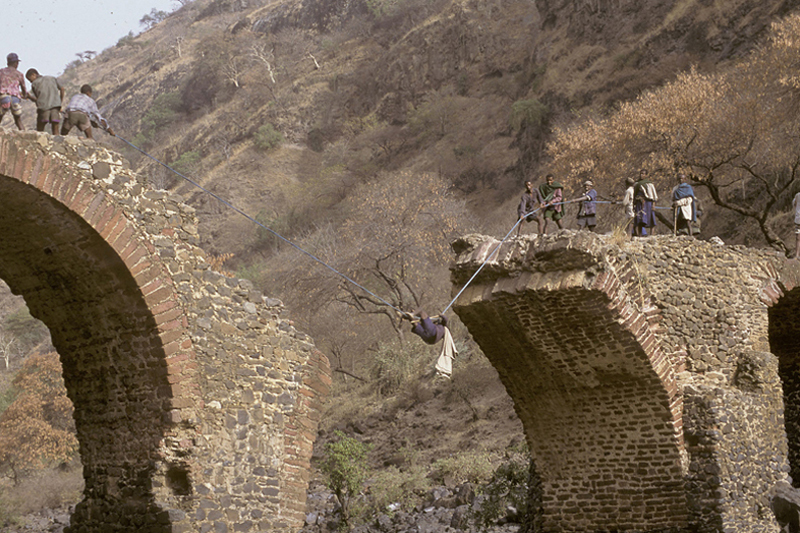 In March, 2001, Ken Frantz saw a photo in National Geographic that showed a man being pulled by rope across a gap in a massive stone bridge missing its mid-section in Amhara, Ethiopia. The gap stretched 40 across and loomed 50 feet above the Blue Nile River. That photo captured the sheer guts and determination people living in the world’s most remote areas display on any given day just to survive. With 30+ years of experience in construction and development along with his own business, Ken knew he could fix that bridge. Within a month of seeing the photo, Ken had formed Bridges to Prosperity and found a new calling: to build or repair bridges for the poor around the world.